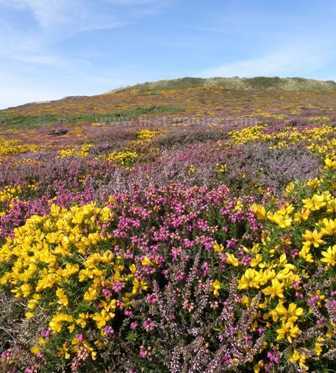 If you visit South Stack Cliffs RSPB Reserve in the summer the enormous area of heathland that surrounds it is such a blaze of colour with heather, gorse and rockrose that it's quite possible to forget what you came to see - the birds, of course! Anglesey is a wonderful place to see birds, and so it is no coincidence that there is more than one RSPB nature reserve on the island. Not far away is RSPB Valley Wetlands, which is quite different from South Stack Cliffs reserve and also well worth a visit while you are in the area. Other national nature reserves that are a must for visiting birds lovers on the island are the Anglesey Fens - a unique habitat that supports numerous birds, insects and plants, including a number of rare wild orchids. On Anglesey, take the A55 dual carriageway from Bangor to Holyhead and then follow signs to Holyhead Town Centre, from where the reserve is signposted. 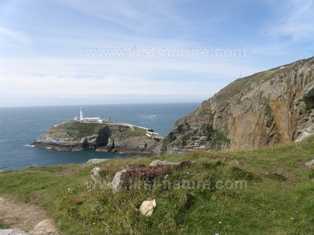 South Stack Cliffs RSPB Nature Reserve is situated approximately 5km (3 miles) from the town of Holyhead. There are two car parks. Most of the paths in the reserve are steep and rocky, and so they can be slippery in wet weather. A good, wide path suitable for wheelchair users and for prams and pushchairs runs from the lower car park, through the heathland, and down to the Visitor Centre, which has a viewpoint. Entry to the reserve and its facilities is free of charge, but donations to the valuable work of RSPB are always gratefully received. There are information boards on site, and also an Information Centre in Ellins Tower which is open from Easter to September from 10am to 5pm. South Stack Reserve also boasts a completely refurbished Visitor Centre with a shop and cafe which serves freshly prepared hot and cold dishes. Their locally sourced desserts are a speciality. The cafe is open every day, excepting Christmas Day, between 10am and 5pm. 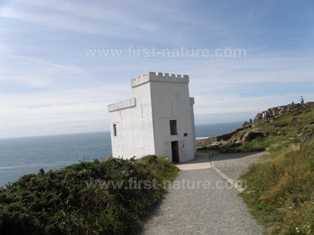 For serious bird watchers an early morning visit in early summer is the best way to be sure of seeing lots of the birds at South Stack Cliffs, and without doubt the star attractions are the sea birds. But remember that by the end of July some of them will have already left. Guillemots, Razorbills and Puffins are among the first to depart. The numbers of these special birds that nest on the cliffs are impressive - about 100 pairs of Puffins, over 3,000 Guillemots and 1,000 Razorbills (Alca torda) can be seen there along with Shags, Kittiwakes and Fulmars. Another speciality is the Chough, a member of the crow family that is becoming very rare in the UK. The nature of the fields and the heathland around South Stack make it an ideal place for Choughs to forage for food, and South Stack is one of the few places where these birds live all year round. Anglesey is a great place for seeing Peregrine Falcons, and South Stack is no exception; no doubt the other birds provide plenty of food for them, and one or two pairs of these falcons nest there each year. For those interested in plants, this reserve is where you can see some uncommon species. South Stack is one of only two locations in Wales where the Spotted Rockrose (Tuberaria guttata) is known to occur. In spring the cliffs are dotted with mauve Spring Squill (Scilla verna), dazzling white Common Scurvygrass (Cochlearia officinalis), bright yellow and orange Kidney Vetch (Anthyllis vulneraria) and pink cushions of thrift (Armeria maritima). Devil's-bit Scabious (Succisa pratensis) also grows here along with the beautiful and delicate pink Bog Pimpernel (Anagallis tenella) and Heath Spotted-orchid (Dactylorhiza maculata). Rather more attractive than its name suggests is another real rarity - the Spathulate (spoon-shaped) Fleawort, is endemic to the clifftops at South Stack. South Stack Cliffs form part of the Glannau Ynys Gybi Site of Special Scientific Interest, an area designated for many several including the wonderful wealth of birdlife which most often prompts a visit to the reserve. The exposed cliffs and rocks, which provide such a vital nesting and breeding resource for the seabirds, are of particular interest to geologists because they and some of the inland outcrops are examples of Precambrian rocks. Other habitats in the area support a variety of endangered plants, animals and insects - the Brown Hare (Lepus capensis), the Silver-studded Blue Butterfly (Plebejus argus) and a number of important plants, for example. The caterpillars of Silver-studded Blue Butterfly are dependent on young gorse, broom and Bird's-foot Trefoil (Lotus corniculatus) plants, and so the site must be managed in a way that safeguards these plants. If you enjoy your visit to South Stack Cliffs RSPB Reserve, please make a donation towards the work required to conserve these valuable wildlife resources.